A similar response would be tempting when confronted with the news that Phillip Ruddock has been appointed Australia's first Special Envoy to the United Nations on Human Rights. This, after all, is a man who was publicly asked by Amnesty International not to wear its lapel badge from that organisation, the one who fronted the Tampa debacle for the government and who pioneered the original Pacific Solution on which the current (crueler) version has been built: including denial of access to legal services for detained asylum seekers and temporary protection visas for those seeking permanent protection. Looking beneath the surface, however, the Australian government's message is clear, if not necessarily well thought through. The United Nations Human Rights Council is hardly a spotless institution at the moment. Chaired by Saudi Arabia, that bastion of multireligious free speech and democracy, it includes among its members a number of countries (the UAE and Viet Nam stand out) whose history of protection of human rights is, to put it politely, somewhat patchy and certainly worse than that of Australia. Why not enter into the spirit of things by appointing someone whose record on immigration and asylum — one of Australia's most neuralgic human rights areas and one on which it is most obviously deficient — is plain for all to see? It is hard not to agree with David Tyler in seeing Ruddock's appointment as one in the eye for all those human rights do-gooders who are the first to cast a stone but who — at least in the case of the current council — have more than enough sins of their own to expunge. If the appointment is about demonstrating the worthlessness of current international human rights protection structures (and the consequent hollowness of their criticisms of Australia), however, it is a rather short sighted one — both for Mr Ruddock in particular, and for Australia in general. There is no doubt that human rights has been an issue dear to the new special envoy's heart, as evidenced during his work for Amnesty International in the 1980s and 1990s, even if the areas of immigration and refugee law subsequently marked a certain blind spot for him. Now, however, if he attempts to raise the human rights records of other countries (many of which are much grimmer than Australia's) he will be cheerfully ignored and have his own tenure as immigration minister thrown back at him in response. So he is unlikely to be a very successful envoy. Of course, that will not matter if the intention is indeed to signal contempt for international human rights bodies. Nevertheless, to do this would be a mistake for Australian diplomacy more generally. Australia has traditionally followed the US in claiming to uphold a rules based international order where trade, foreign and military policy are at least nominally linked to human rights and the rule of law. Admittedly, it and the US (like all other nations) have been hypocritical about their declared aims, and human rights have often served as a convenient cover for regime change — often with a view to a cynical grab of natural resources. Internally, civil liberties have become increasingly shrunk with each passing year (metadata collection, citizenship revocation and anti-terror powers stand out). Nevertheless, and notwithstanding all its shortcomings, the aspiration has always been held out: countries are measured against human rights goals in both public rhetoric and policy in fora controlled by the US and its allies. Australia has observed human rights in many areas of its domestic law (it has an independent judiciary and regular elections, for example), allowing it a seat at the table when human rights in other countries come up for discussion. This advantage — a very potent form of 'soft' or non military power — has allowed it to claim human rights as relevant standards by which other countries can be held to account — however imperfectly. Appointing a person who is known to have a weak record of upholding human rights in the area where Australia itself is weakest sends the unmistakable signal that Australia is no longer committed to the human rights project. In much the same way as the country's asylum seeker policies have emboldened the Thai and Myanmarese governments in their treatment of Rohingya and their refoulement of others facing persecution, the demonstration that Australia itself regards the process and institutions of human rights protection as no longer worthy of serious engagement sends all the wrong signals to the people the government would most like to influence. Justin Glyn SJ is studying for the priesthood. Previously he practised law in South Africa and New Zealand and has a PhD in administrative and international law. Recent articles by Justin Glyn. Perhaps we are missing the point here. Maybe Ruddock's appointment is not about defending human rights as such, but defending the Abbott/Turnbull Government positions on human rights. Seen in this light and given his track record, the appointment of Ruddock is entirely appropriate. Then again, maybe the Prime Minister just appreciates irony. It is a pretty good moral guide to put 'principles before personalities'; to condemn the sin but have compassion for the sinner. But what to do if the person embodies the principle? There are several principles involved here in the Ruddock appointment. The PM decides what jobs go to which boys. If the PM can't get an MP to resign he offers him a job he can't resist. Or the most disheartening: every man has his price. Politics is like 'Nature red in tooth and claw' - only worse, because we hang on to the forlorn hope that those with the power will exercise it with magnanimity and not blatant self-interest. I think Brett has made a very good point. 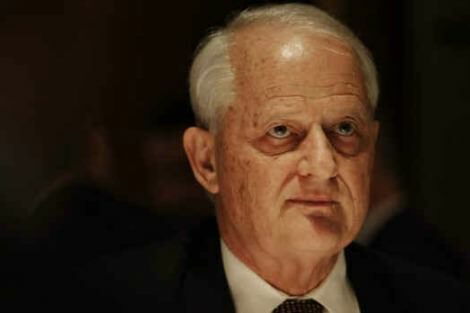 Ruddock makes a mockery of human rights. His hands are very dirty. Jobs for the boys. Nothing about actual human rights. Thanks Justin for making some sort of sense of this outrageous appointment. I felt angry and embarrassed when Ruddock's new role was announced but perhaps it is the Government's way of showing its contempt for genuine human rights advocacy. Not only is Mr Ruddock's record on refugees badly tainted, he also once sought to justify a policy decision by remarking that Aboriginal people had 'not invented the wheel', implying that this was evidence of backwardness. I suppose he refused to retire unless given this consolation prize. Well said Justin. This is a disturbingly disappointing appointment that's more about jobs for the boys rather than a genuine quest to promote human rights. I pray for a turning of the tide that will show justice and compassion on our streets, tabloids and borders. It is right and good that the outpouring of community and professional goodwill has at least delayed the return of baby Asha to what are reported to be the terrible conditions of the detention centre on Nauru. But Australia's asylum seeker laws involve unresolved systemic issues that such wins cannot by themselves resolve. Widespread community focus on individual cases such as that of baby Asha may in fact prevent action on the deeper issues from gaining traction. On Sunday, Immigration Minister Peter Dutton seemingly relented, allowing the child to be released into community detention rather than carting her off to Nauru. It has, however, been made clear that this is no prelude to settlement in Australia. Dutton's line goes to evenness in policy: 'We are going to have a consistency approach here ... intelligence out of Indonesia recently was that people smugglers were reporting ... there was going to be a change in policy.' None of these arguments passes muster.